Rob McInlay has created a detour for his manure that generates energy to run his entire dairy farm. What looks like a large yurt is actually an anaerobic biodigester that turns manure into electricity, generating 20 Kw from two 10 Kw “gen sets”. Connected to the electrical grid since March 2018, it more than supplies the hydro needs of Harcolm Farms near Beachville. “I really like the idea of having a closed loop on the farm and making the best use of our manure,” says Rob, who farms with wife Rachel and her parents, Dwight and Nancy Hargraves. Sustainability is key, but so was viability and simplicity. Being a mechanical engineer with a fascination for technology and equipment, the process appealed to Rob. “I enjoy taking complex problems and boiling out the simplicity,” he says. With these goals, and in partnership with John Hawkes, the president and CEO of Wayside Energy Inc., in Toronto, he decided to go with a ready-to-use pocket digester from Biolectric in Belgium. “We didn’t want to build our own system. We wanted to use exciting technology ... why learn all our lessons the hard way?” questions Rob. The fully-automatic biodigester was specifically designed to work on farms by creating green energy from manure sources. The system is pre-packaged or “containerized” requiring little set-up. The Harcolm Farms system, the only one of its kind in Ontario, came by ship with all the mechanical components housed in a container. The yurt-like digester made of stainless steel had to be assembled. Two Biolectric installers came from Belgium to aid in the set-up. “It took eight of us four days to set it up,” remembers Rob. It required a concrete platform (part of the cost) and some adjustments to the dairy barn to bring fresh manure from the barn to the digester. It automatically pumps fresh manure in on a daily basis. After 20 days, the manure is discharged into a large lagoon at Harcolm Farms. On the day of this interview, the liquid manure was being pumped out and spread by a custom manure spreader. It’s a messy business to be sure but a relief for Rob to get this task underway in a wonky crop/weather year. Meanwhile, the biodigester keeps working. A ladder tipped against the reactor allows us to peek through a circular glass window to see the manure bubbling away. Biogas is formed in the reactor through anaerobic fermentation which requires heat and stirring. The heat is supplied from waste heat from the engines. It’s run through water pipes coiled at the bottom of the reactor. A submersible mixer stirs the manure for two minutes in a 15 minute cycle. “Stirring is necessary because the biological organisms that make the gas are not motile,” says Rob. The gas is purified and turned into energy in the combustion engine. The resulting energy is used on the farm in the form of electricity and heat. “There is an elegant simplicity to it. It’s a clean design,” says Rob. Cost-wise, he estimated payback in 10 years with the following 10 years offering significant energy savings and profit. Payback comes in two forms: hydro saved and hydro purchased. Harcolm Farms executes two contracts with Hydro One. The first is a Net Meter contract that provides a cost-avoidance savings of about 20 cents per kWh or $12,000 annually. The second was a MicroFIT contract where the farm ships surplus electricity back into the grid at a price of 25.9 cents per kWh or $20,000 annually, reports the Bloom Clean Technology Demonstrations Project Case Study which Rob and John are involved in. The outlay, however, was significant. John Hawkes, who is marketing the biodigester with the Martin Energy Group, believes similar setups could cost in the range of $350,000. 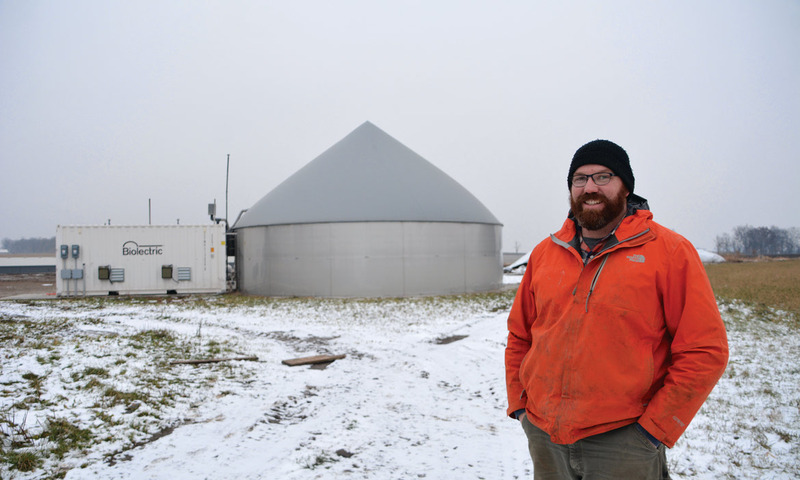 However, being the first of its kind in Ontario, and requiring some barn modifications, the Harcolm Farms biodigester came close to half a million. Since it was installed in March, the digester has had very few problems. Any issues have been able to be resolved by phone in conversation with Belgian technicians. These were mainly software issues. All told, Rob thinks installing a manure digester on farm is a no-brainer. While saving on hydro costs, he makes double-use of the farm’s manure. He suggests that the fertilizer value of the manure may even increase after passing through the digester since the organisms already start the digestive process. However, this is the first spread of the manure which has passed through the digester so there has been no chance to monitor any yield increases. Neither has Rob been able to find anything other than anecdotal evidence supporting this theory. He has noticed the manure has a different smell. When the digestate is hot, “it has a bitter, rather than sweet smell.” However, in terms of rating it by “stink”, there is less odour than raw manure, he believes. Labour-wise, Rob says the digester needs monitoring but it isn’t time significant. Labour isn’t physical. Rather, it’s a process of flipping switches. “It certainly doesn’t require an engineering degree to operate,” says Rob. So does Hawkes. As the man who did the legwork seeking government approval, building permits, organizing farm integration and much of the adaptive work required to properly integrate the system on a farm, he is keen to see biodigesters take off. Now in partnership with the Martin Energy Group, the biodigesters are being manufactured in North American with Canadian technicians stationed in Leamington and Kitchener. Two more biodigesters are being installed in Vermont and Pennsylvania but uptake in Ontario is slower. However, the younger generation, with their commitment to recycling and sustainability love the concept. Also, they see from McInlays project that micro digesters work without intense labour requirements, such as larger biodigesters which use a multitude of additional byproducts. Hawkes estimates a new micro digester like McKinlay’s would cost in the area of $350,000. The biodigesters are ideal for dairy and hog farms with liquid manure. Manure needs to be in a slurry format to work in a biodigeter. The system wouldn’t work on farms that use sand for bedding. “Sand is inert and fills up the tank,” explained Hawkes.